Order - Begin an engagement involving your Leadership personnel. 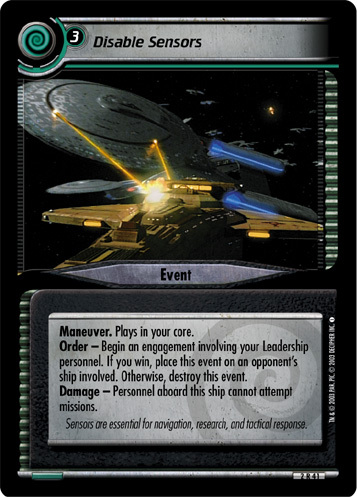 If you win, place this event on an opponent's ship involved. Otherwise, destroy this event. Damage - Personnel aboard this ship cannot attempt missions. Sensors are essential for navigation, research, and tactical response. Characteristics: engagement, plays in your core, Damage, Maneuver, prevent mission attempt. There are 15 entries for Disable Sensors (ST2E 2 R 41) at the Tradeplace (5 haves and 15 wants). Click here to see all trade list entries for this Rare card!